ASAPS: HF Prediction online & free! Flight AF 128 from Paris to Beijing: What is the best time/frequency combination to communicate with Stockholm AOCC on HF en route? 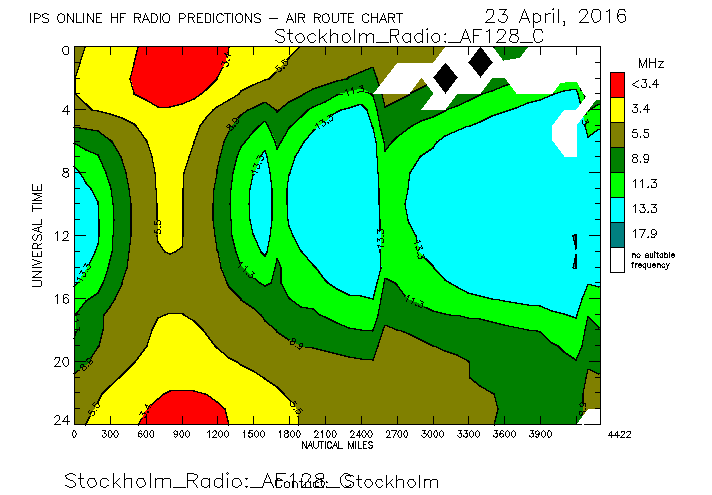 HF prediction seems to be a somewhat neglected field among short wave listeners, as well as hams. At the same time, some knowledge of how propagation works on specific paths or into defined areas will greatly enhance your hunting success. If you have considered the somewhat flat learning curve of some software as an obstacle, there now is no excuse. With ASAPS’ recently even more improved online services, you are on the sunny side of HF right now. I had written a short paper explaining how this free service can be used especially for Utility DXing. If you also ever wanted to know the relation of a waste paper basket and multi path propagation, please download this PDF (7 pages, 22 illustrations) here.